Hari Raya Haji, a vibrant Muslim festival widely celebrated in Singapore. 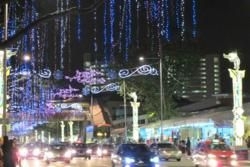 Exactly 70 days after the holy month of Ramadan, Singapore's Muslim community celebrates Hari Raya Haji. Families gather and celebrate over a 3-day event. Hari Raya Haji, also known as the "Festival of Sacrifice" or the "Pilgrimage Festival" marks the end of Hajj, the annual holy pilgrimage to Mecca and commemorates Prophet Abraham, considered as the father of Islam. The story tells that God asked him to sacrifice his son but placed a sheep under his hand when he was about to use the knife. Abraham trusted God blindly with his son’s life and was reassured in his belief. Since that day, Muslims all around the world follow the path of Abraham and sacrifice a sheep. In Singapore, where all races and religions are well respected and in harmony, Hari Raja Haji is a public holiday. Male Muslims meet at the mosques for prayers after which they sacrifice livestock to Allah. Out of respect for Indian residents, the sacrificed animals are always sheep or goats but never cows. The meat is then shared within the family, distributed among relatives and the poor. 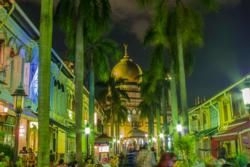 In the evenings, many people, both locals and travelers, visit the area around Kampong Glam, Arab Street and Haji Lane where cafes invite to enjoy a chat with friends while tasting Mint Tea and smoking Shisha. With an open-minded community in Singapore, anyone is always welcome to join the festival. Its custom for Muslims to wear new clothes on these days and children get money from their parents and adult family members. 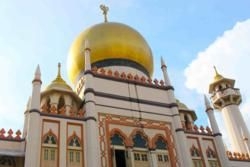 Visit the areas around Geylang Serai and Kampong Glam with it's beautiful Sultan Mosque and enjoy the busy bazaars with many fancy decorated stalls offering colorful clothes, decorations and – of course – popular dishes. It is a great occasion to learn about the ethics and practices of Islam and a reminder to share with the less fortunate. Hari Raja Haji 2013 is celebrated on the 15th of October. Take public transport such as MRT. Traffic is usually heavy in this area during the celebrations and parking space rare. You might also encounter difficulties to catch a taxi back as they avoid the congested area. During these days you might experience more traffic on the entire island as Muslim visit their families and friends. Be considerate when entering a mosque and take off your shoes. Women are required to cover their head, legs and arms and not allowed in the main prayer hall. In public spaces such as the bazaars, casual clothes are perfectly fine. Festivities that are of interest for visitors take place during evening hours, starting in the late afternoon.